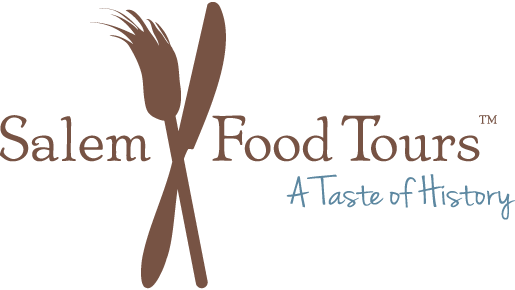 Salem Food Tours, established in 2012, are the perfect way to explore historic Salem, MA. Join host Karen Scalia and enjoy tastings at some of Salem’s best food shops and restaurants. Our five-star rated Tours bring history to life through the senses. As our guests say, “It’s like a roaming dinner party!” Enjoy chats with chefs, shop-owners, and fellow foodies. Learn about early colonial dinners, local history and culture, as well as Salem’s illustrious maritime spice trades and more. With today’s culinary renaissance and Salem’s renowned food scene, locals and visitors on our Tours agree—Salem is truly a vibrant, fun, and delicious place to explore! Salem Food Tours are $58 per person. Your ticket includes all food and wine tastings, and runs approximately 3.5 ish hours in the afternoon. These walking Tours book in advance and run all year. We make a minimum of 5 stops, including restaurants and shops. Please visit our FAQ page for further details about our regular Food Tours. Our popular AM Coffee Walks give guests a great overview of our delicious City. Walks are $25 per person and include complimentary organic coffee or tea (or bottle of water), a sweet treat, a mini spice tasting, and finish with a complimentary beverage. As we Walk you’ll enjoy information on our local history, including our illustrious spice trade history, walking past historic landmarks, and learning about our wonderful shops and restaurants, dynamic cultural scene, and more. When we’re done you’ll know where to eat, shop and visit! Daily AM Coffee Walks start at 9.30am and take about an hour and a half. We offer these tours by request all year except on major national holidays. Coffee Walks are open to all ages, children under 6 free. Coffee Walks are also great for larger private or corporate groups, can be custom crafted, and pair very well before a sit down lunch or dinner in Salem! Afternoon Strolls include the same great information as our AM Coffee Walks. Strolls include fresh New England clam chowder (or vegetarian soup option), cheese, wine, sweet, and spice tasting. $41 per person includes all tastings. We offer Afternoon Strolls (also called Weekend Kick-off Strolls) on Friday afternoons by request and every Friday in October. Strolls typically run 3pm to 5.20pm ish. Join us for a fun and delicious excursion on our sister Tour of Salem’s locally made and award-winning craft products. Hop aboard the Salem Spirits Trolley and explore the history of Salem’s illustrious spice trade, learn about the role of spices in the production of spirits, and enjoy delicious samples of locally produced craft products like hard cider, gin, rum, and beer! This fun and informative journey is $45 per person and runs approximately 2.5 hours in the afternoon. You’ll be seated on the charming Salem Trolley and travel through some of Salem’s prettiest historic neighborhoods. Your host for this Tour is renowned local comedian Mark Scalia. Private Bookings for the Salem Spirits Trolley hold groups up to 30 guests and are available on Thursday, Friday and some Sunday afternoons. Please contact us to learn more and custom craft your event. Kindly note: ages 21+ only. State ID required. The Salem Spirits Trolley is committed to fun but also a responsible environment so that all patrons will enjoy the tasting experience. We reserve the right to refuse service if deemed necessary. A deliciously special excursion for your group! Salem Food Tours are the perfect excursion for private and corporate groups. Let us whip up a delicious experience, whether it be for an office party, family reunion, anniversary, or just to gather friends and celebrate time together. Private tours make a stellar business or team building outing, a great thank you for a client, or an enriching afternoon for your executive team. We’ve welcomed businesses from banking to technology to healthcare and more on our Tours. Both walking tours and trolley excursions are available. Contact us today for more information! Let us custom craft a fun and memorable afternoon with your wedding party, family members and friends. Contact us for details on our bridal offerings.